My first recommendation is the Disney princess colouring book . I have this particular one and the page designs are just stunning. There are some others on the market that are less expensive but this is by far the nicest one I’ve seen. 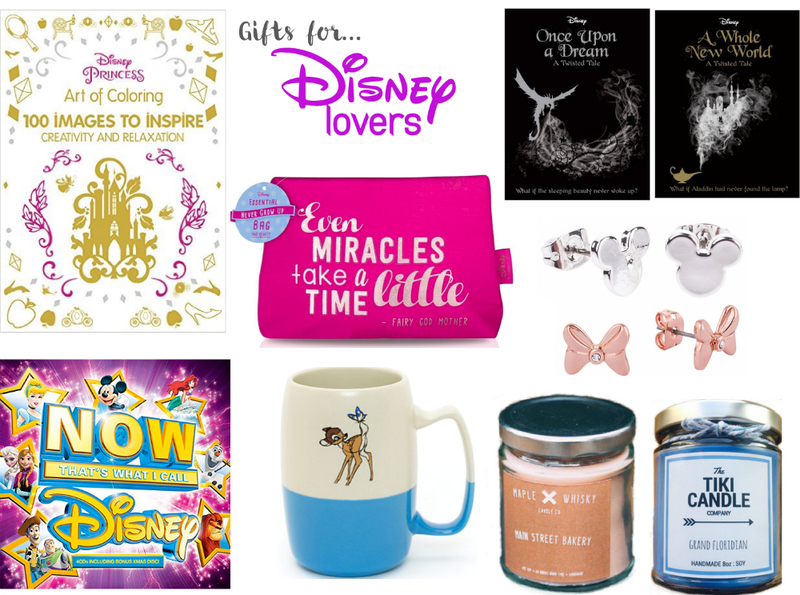 If you know someone who loves both reading and Disney, I have the perfect gift. Disney Twisted Tales are reimagined versions of the Disney stories we’ve all come to know and love. At the moment there are two available: Once Upon a Dream based on on Sleeping Beauty, and A Whole New World retells Aladdin. No Disney fan should be without a CD full of Disney songs to sing along to. A great buy is ‘NOW That’s What I Call Disney’ ; I have this in my car at the moment… It has 3 discs full of songs, and an extra disc with christmas songs. A Disney scented candle would be a really nice treat to receive… For a sweet scent try this Main Street Bakery one from Maple & Whisky or a fresher scent option would be The Tiki Candle Company’s Grand Floridian which apparently smells just like the lobby of the hotel! For the ladies who love makeup and jewellery, this ‘Even miracles take a little time’ makeup bag is super cute! And some earrings are a nice subtle way for them to show their love for Disney… My favourites are these rose gold Minnie Mouse earrings or this pair of white gold Mickey Mouse earrings . Finally, a mug is my fail safe gift when you just don’t know what to get someone… I think this Bambi mug is perfect.